Manaslu Larke Pass Trek - BOUNDLESS HIMALAYAS TREKKING & EXPEDITION (P.) LTD. 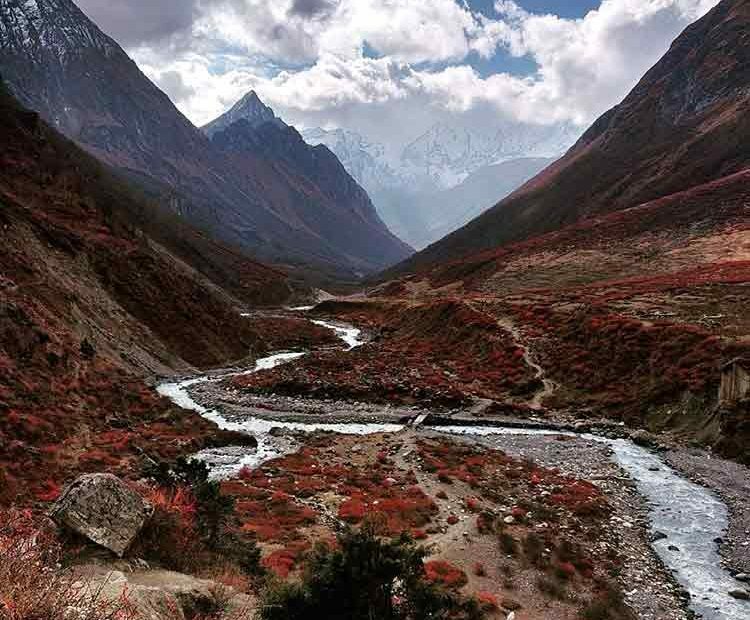 Located in west-central Nepal the region is spectacularly beautiful, it lies along the border of Nepal and Tibet and it is a controlled trekking route due to the sensitivity of its position on the Tibetan (Chinese) border. Only organised trekking groups via a trekking agency are allowed and all supplies necessary for the trip (including food and kerosene) must be carried in and all rubbish must be portered out. The trek itself is a 177-km in legnth and you can expect some fantastic mountain scenery that spans altitudes that vary from 375 m to 5.300 m. there is also a highly diverse range of ecosystems and ethnic cultures and you are physically closer to Tibet than any other trek in Nepal. This is without doubt a spectacular journey around Manaslu and into the northern Himalayas the aim is to completely encircle the great Manaslu-Himalchuli-Baudha massif. The Manaslu Region opened to trekkers in 1991 and a special permit is required ($U.S.50 per week plus an extra $7 per day spent trekking)the region is far less trekked than any of the popular regions perhaps because it is a demanding area and you need to be in good physical condition.The Tibetans of the upper Budi Gandaki, a region known as Nupri, are direct descendants of Tibetan immigrants. Their speech, dress and customs are almost exclusively Tibetan and there is still continuous trade between Nupri and Tibet. The mountain views in Nupri are sensational and the Larke pass (5,213m) is a dramatic Himalayan pass to cross. Many seasoned trekkers rate the Manaslu Cicuit as one of the best in Nepal and whilst the going is tough at times the rewards far outway any personal physical outlay.It is in fact not only exciting and adventurous it is a once in a lifetime experience. Day 03 : Drive to Arughat-500m (6 hr) by private car/van. Day 04 : Trek to – Arkhet-650m ( 5-6 hr). Day 05 : Trek to – Labu Bensi-700m (6-7 hr). Day 06 : Trek to – Tatopani-800m (5-6 hr). Day 08 : Trek to – Ngyak-1550m (6-7 hr). Day 09 : Trek to – Namru-2450m (6-7 hr). Day 11 : Trek to – Sama Gaon-3450m (5-6 hr). Day 12 : Trek to – Samdo-3900m (4-5 hr). Day 13 : Rest and acclimatisation at Samdo or hiking around . Day 14 : Samdo – Dharmashala-4480m (4-5 hr). Day 16 : Bhimathang- Karche-2550m (5-6 hr). Day 17 : Karche- Dharapani-1943m (6-7 hr). Day 18 : Dharapani- Jagat-1314m (6-7 hr). Day 20 : Bhulbhule – Besishahar, Manaslu trek ends here. Day 22 : As per your flight schedule, transfer to airport and fly back to your next destination with beautiful memories of your trip.